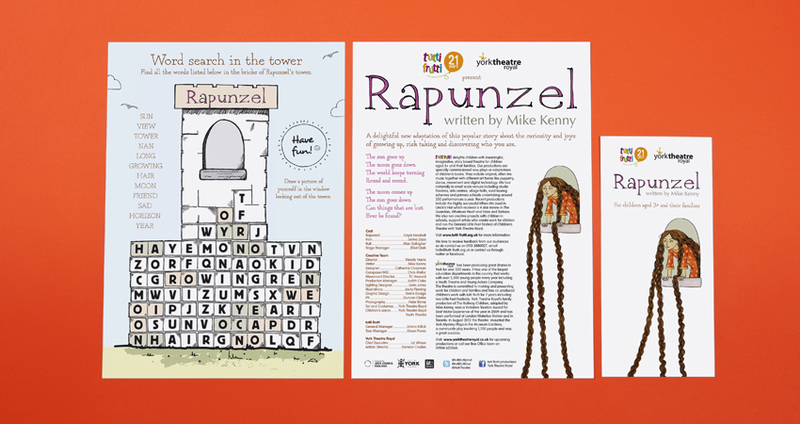 Rapunzel print marketing – no time to let my hair down! You are here: HomeBlogRapunzel print marketing – no time to let my hair down! The latest children’s theatre production by my client tutti frutti is Rapunzel. I was commissioned to undertake some design and print marketing activity for the show publicity. The resource sheet which is handed out after the show this time took the form of a word search in the shows theme. A hand drawn illustrative approach keeps the marketing on brand, but also ‘softens’ the design to appeal to the children. To compliment the leaflet and posters i was also commissioned by York Theatre Royal to design a 3 meter vertical banner which was hung in the entrance way to increase awareness and encourage tickets sales. A fun project which was a great success.